Our tire experts here at Schmelz Countryside Saab know our tires and are confident in being able to find the tires that live up to the everything you expect from your Saab. 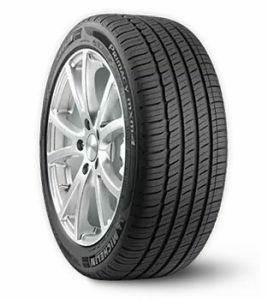 This Michelin is one of our favorites and is a good match for your 9-3 Saab with 16 Inch or 17 Inch Wheels. Our knowledgeable Saab Staff, will be happy to assist you in choosing the right tire for your vehicle. Contact us today to schedule an appointment, or if you are anywhere in the Minneapolis / St Paul Area, come down and see us today! A unique self-supporting construction that locks together for greater rigidity when traction is needed most, allowing the use of more sipes for adverse road conditions (wet and snow) without giving up the handling and wear performance.